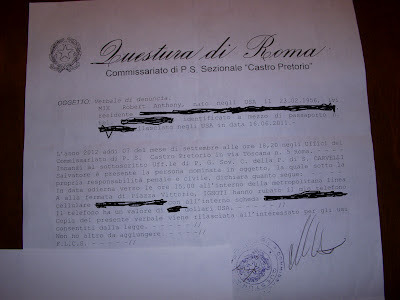 Yesterday I wrote an article on how the citizens of Italy are selling their gold to survive... I did take other pictures during our trip (while my wife was taking pictures of Baroque churches, historical sites, etc.). Hey, if you want pictures of The Vatican. the Colosseum, the Roman Forum, Venice, etc., you can find those pictures in lots of places! Part of the port of Taranto, you can see (if you look closely) both steel slabs (I guesstimate about that the steel slabs were maybe 1 meter thick), you can also see rolled steel sheet in the back to the left. We rented a car in Bari and drove to various towns (including Taranto, Matera, Lecce, Brindisi and Gallipoli). All of these towns and cities are in Apulia (SE Italy) except Matera which is just over the boundary in Basilicata. From Taranto to Brindisi we drove along Highway 7, which follows the ancient and most famous of the Roman Empire's roads: the Appian Way (Via Appia). The Via Appia ends in Brindisi, Italy, the Romans marked the end of their famous road with two columns. Here is one of them, you'll see the other soon. People who like history might enjoy the fact that the Roman poet/writer Virgil (who wrote The Aeneid) died within sight of the columns in 17 BC. Two of my favorite pictures of Brindisi! Brindisi is the main port of entry for people coming from Greece, Turkey and Albania. I mentioned earlier about the "other column" that is now no longer in Brindisi. Turns out that Lecce also has a claim to being the SE end of the Via Appia, so they wound up with the other column (now at the amphitheater there in Lecce, the Empire's second largest amphitheater). Someone later on put Sant'Oronzo (St. Oronzo, also the name of the piazza) up on the column. Italy is a fascinating country with many marvels. Yes! There is history in every corner of the country. But, we have been to Italy various times now, and I wanted to take OTHER kinds of pictures! Once you have seen the main attractions (Rome, Florence, Venice, Naples) there are still many other interesting places to see. Apulia is one of them. There is often real value to be had when you get off the beaten path. As a frequent visitor to Taranto I can tell you that ILVA (the steel plant) produces about 30% of the steel used in Italian industry, and definitely works at a profit - especially given the money its wealthy owner has saved by not implementing health and safety measures to reduce the appalling pollution in the area - but predictably the wealth does not seem to have trickled down to the workers and their families. There is currently a campaign to have it shut down as local people are fed up with the situation. However, parts of the city do have a certain charm, I hope you had a chance to walk around the more picturesque albeit delapidated "centro storico" on the island.